RoseLineMaps Oregon - Peak Finder. What is visible from any location? RoseLine Oregon lets you explore the mountains of Oregon, showing you the visible peaks from any location including into the neighboring states. Approximately 4500 named peaks, summits, hills, ridges, cliffs, pinnacles, etc. Includes approximate 6000 more named peaks in the surrounding states. 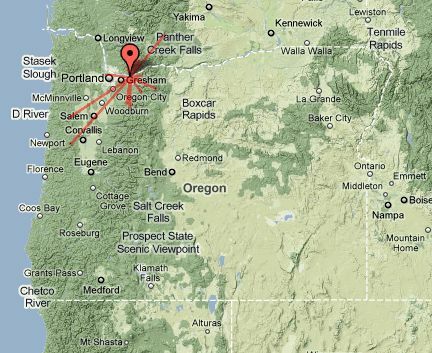 Will calculate the visible summits for any location in Oregon including the peaks in the neighboring states. Viewpoints are limited to the summits in the free version of the program. In the full version you can create custom viewpoint anywhere in the state including your own living room. Creates maps for Google maps and National Geographic TOPO. Check out the fun page for cool stuff you can do with RoseLine.